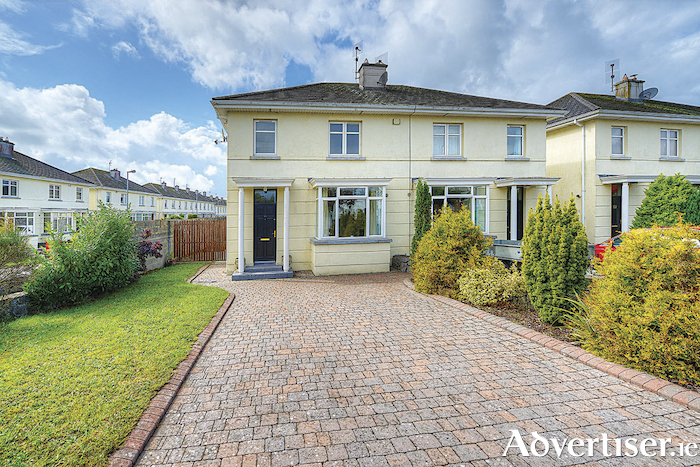 DNG Maxwell, Heaslip & Leonard has just launched to the market this stunning three bedroom semidetached house in the ever popular Oranhill development in Oranmore. It is within walking distance of Oranmore village, the lovely Renville Park, and both Galway Bay Golf Club and Galway Bay Sailing Club. Additionally, all services and amenities are to hand, including national and secondary schools, shops, restaurants, and excellent bus and rail links. Part of a mixed residential development, this spacious property is located to the rear of the development and is finished to a very high standard and is ready for immediate occupation. The property comes with the benefit of off-street parking to front, wide side access, a large rear garden, two en suite bedrooms, and gas fired central heating. The house extends to some 1,000sq ft of living space including an entrance hall, living room, kitchen/dining room, and guest wc on the ground floor. Accommodation to the first floor comprises three bedrooms, two of which are en suite, and the main family bathroom. Guiding at €265,000, viewing of No 10 Oranhill Drive can be arranged by calling 091 565261.